Home › Alarm Systems & Security › Burglar Alarm › cardot PKE car alarm .. Important attention: this product does not have auto start ，does not include password key pad ,if needs it adds extra value . Auto lock or unlock car door without pressing remote lock or unlock button. 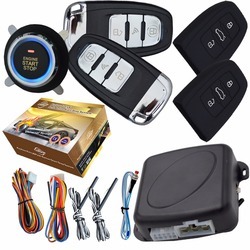 1pc main unit,2pcs smart metal remotes,1pc cardot key leather covers,1pc start stop button,1pc 6P start cable,1pc main cable,1pc outside learning button,2pcs pke antennas,1pc english manual,1pc color packing box. so we won't send you remote battery. 2.our product doesn't support pheumatic central lock car,also doesn't support electronic steering wheel lock.